If you don’t have private medical insurance but want the speed and flexibility of the private sector, Thames Breast Clinic has a solution for you. We have teamed up with a number of private hospitals to put together affordable diagnostic and treatment packages. In many cases, finance options are available too. 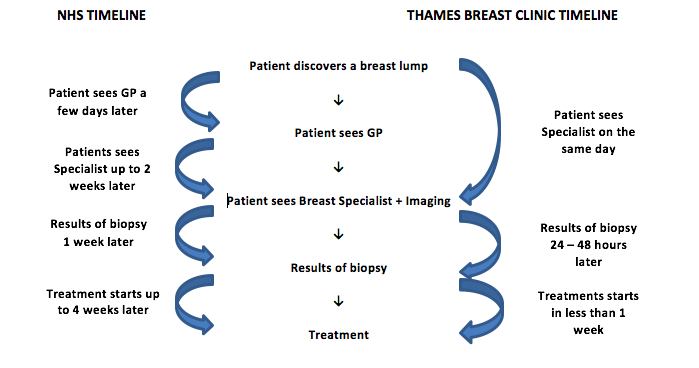 At Thames Breast Clinic we offer a One-Stop Diagnostic Clinic for £550. For patients who have been diagnosed with a breast cancer we can offer breast cancer surgery within days at a private hospital from £2,495. Unprecedented pressures on the health service means that patients typically have to wait up to two weeks before being seen in a breast diagnostic clinic and another four weeks before commencing treatment if needed. This wait can be even longer if further tests are needed. Even once surgery has taken place, it takes between two to three weeks for the results of the surgery to become available. The resulting anxiety and stress of waiting for more tests or a date for surgery can be enormous for a patient and their family. Self-pay patients who are worried about a breast lump or a change in their breasts can contact Thames Breast Clinic on 01753 439313 and will be seen on the same day in the One-Stop Diagnostic Clinic for £550. For patients who have been diagnosed with a breast cancer and who are awaiting a date for surgery in the NHS, Thames Breast Clinic can offer breast cancer surgery within days at a private hospital from £2,495, with results from the surgery being available 4 to 5 days later. Once the surgery has been performed, patients can easily be transferred back to the NHS for their further care and follow-up. The transition to and from the NHS is simple, speedy and efficient. It does not delay a patient’s subsequent treatment in the NHS and is a process that the Thames Breast Clinic team are fully familiar with and frequently utilize. Once the surgery has been performed, patients can easily be transferred back to the NHS for their further care and follow-up. The transition to and from the NHS is simple, speedy and efficient. It does not delay a patient’s subsequent treatment in the NHS and is a process that the Thames Breast Clinic team are fully familiar with and frequently utilise for self-pay patients. If you have been diagnosed with a breast cancer and would like to consider self-funding your surgery, please arrange an appointment with our Consultants who will advise you regarding your options. Please do not worry of you do not have the results of your biopsy or breast imaging with you; our team will obtain all this from the NHS on your behalf prior to your appointment with our Consultant. Please do not worry if you do not have the results of your biopsy or breast imaging with you; our team will obtain all this from the NHS on your behalf prior to your appointment with our Consultant.